First off, Happy 27th birthday to my wonderfully awesome hubby, Pete. That's us above. I've had pics of me on many of my last blog posts...figure I will keep up the trend for one for day...lol. That's us in Cocoa Beach over Easter Weekend (we went down to visit his parents). Also, happy belated birthday to the Book in the Oven Blog! We celebrated our first year of writing about my author struggles on April 22nd! I only realized it because I remembered blogging about Pete's birthday last year. Oops. I can't believe that it has been a full year, although I've had a couple blogging holidays. I've not been as faithful as some of my blogging buddies! I love this blog because it gives me a space to connect with other aspiring writers and even some published authors. I don't know anyone who has ever had the dream to write a novel and it makes me feel like it is something I can do since there are other people in similar situations trying to obtain the same dream. I feel more connected...and it gives me motivation. I loved finding this world of voices and reading about your lives. So really, on my First Blogging Aniversary--and I hope it doesn't sound lame--but, I want to thank the other bloggers for all the interesting and touching stories you have posted for everyone to read. I really do love all of your blogs :). It's funny to look back and think about where I was last year. When I wrote about Pete's 26th birthday I had been working on a different story (well, similar, but the plot line split and basically everything I had done this time last year was thrown out--well, thrown aside for a different book later on. Now I'm about 70% done with the plot line on my current novel and I can really see the light at the end of the tunnel. Hopefully by the 2nd birthday I will be well into the submission process. Either way, I'm going to have a fun time getting there! My little niece, who I will call Mini-Me, is a second grader. That's us above. She and her sister, Blondie Girl, (same age) and brother, Little B, are such great little kids. Of course I am a bit biased, but they really are fun and smart and just plain cute. Mini-Me looks a lot like a little mini-me--thus the nickname. We have similar skin tone, hair and eye color. She is a very tender-hearted little girl and sometimes that can be both a good and bad thing for her as other kids have been known to take advantage of that fact. She is a great big sister to her siblings. She tries to help her younger brother out whenever she can and tries to help him and other younger kids whenever she can. I don't think that she has ever met a person she disliked. 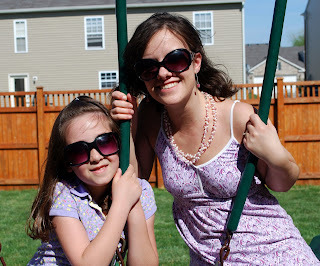 Once a girl named Jessica was bullying her because Mini-Me was picked to be the teacher's helper. Mini-Me figured Jessica was acting that way because she wanted to be the helper so offered to share so that Jessica would feel better. Unfortunately this just pissed Jessica off even more which then just caused Mini0Me to ponder what she could do so that Jessica would be happier. She was sure there was some outside cause rather than Jessica just being a little brat. Aislynn believes that only unhappy people are mean so if you can help them be happy then they will be nice. How many kids want to help the bully? Unfortunatly, Jessica is just a brat (which may morph into another b word once jr high or high school hits). Poor Mini-Me still wishes she could help! Mini-Me wants everyone to be happy with her and she tries very hard to be good at school. Upon receiving a bad grade in Math she went up to the teacher and requested extra homework problems because she felt like she needed extra practice in order to understand everything. Today I went to see Mini-Me and her sister, Blondie Girl's, First Communion. It is a Catholic thing where the children are first allow to receive what we consider the body and blood of Jesus. (please keep any comments cultural and not religious). They were both so adorable in their dresses and veils, which my mom made for them. Afterwords, we went to my sister's house for a little party. After the party Mini-Me and I sat on her Eagle's Nest (the little fort above a sandbox on the playset) and had a very long conversation about writing. We worked on some ideas for a story that I am going to write for them about a princess who can talk to a horse (that ends up actually being a unicorn). I told her about some of my blog buddies who are "real life writers" and others who were working towards it like me. She was so impressed with the concept of you published authors, especially Barrie Summy because of I So Don't Do Mysteries. I tell you what, I think little Mini-Me one day could become a "real life writer". She had so many actually great ideas! The bit about the horse really being a unicorn was her idea. Also, I was so impressed by her willingness to help other children. She is trying to grow her hair to donate to Locks of Love, which I actually did a few years ago. She wanted to learn about other ways to help other kids and we spoke about donating old toys and some of the work I do with the Junior League and how it is good to give of your time to help other people. What a great kid! I took this idea from Charles over at Razored Zen. I talk alot about my school work, typically because I'm blogging when I should be working on that sort of stuff, but I don't talk too much about what I do for a living. My day job is as a Director of IT for a smallish web company that produces a web application that allows larger companies to manage their Cisco devices. We also run a couple other smaller web apps. That is me working on a day that I worked from home. I probably do that about twice a month, but I could do it once a week if I wanted. Usually I perfer to go into the office. Today a client called to talk to me about a functionality push that I had done the night before on my cell phone before I'd even gotten into the office so my day started at 7:45am rather than the normal 8am. There were a couple tiny issues with the push (that I had done around midnight the night before), but mostly he was happy. It was very good because the functionality was a bit late and had been buggy. It had been a bit of a test that my boss wanted to give a guy on my team--and the test did not go well. I had to speak very harshly to the guy about it and my boss knew about the issues from the client...bad situation. So I texted the guy who was working on the project so he could get some positive feedback. Once I got into the office I confirmed the times for the people interviewing on Friday. Then I proceeded to work on code for a couple hours, but paused for a conference call to test some other functionality for a trouble ticket system for Hilton. I've been working on this for about eight months. The problem is that our system has to communicate with these other two systems and getting everyone together was a problem, but on this call everyone was happy...but then we had to talk about who had to cut the final red tape. After the call my boss came to ask me what had happened (even though he was on the call he didn't understand what was going on because it was very technical) so I gave him a debreifing. Then I had to explain a new task for one of my guys followed by helping another figure out how to do something. Then an email came that the system that we had just tested was offically going live at Friday midnight. Yey! I got an email from a client who couldn't access a page. I determined it was because a document had only two letters in its name and the system was confused. Usually clients contact their account rep, but really important ones contact me directly. Typically I fix the issue, although sometimes I give it to one of the guys in my team. I guess I try to do the things that no one wants to do since I could dole it out as the boss. I try to get my hands the dirtiest. Then I had another conference call about a product that we are thinking about purchasing. I had heard of an alternitive product the day before so after the call I found the other product and played around with it. I wrote up a document to my boss and the client as to which I liked better. Our site was slow so I had to debug the issue. It stopped being slow so I just shurgged and called it a day. Although, I had to work on an issue with an import not working starting at 8 to insuring that I could mess with the system and it wouldn't affect users. Many people know that Chicago is known for its classic pizza, but not many people realize that, to most Chicagoians, pizza takes a 3rd place to hot dogs and italian beef. Today I am going to talk about Chicago-style hot dogs, or red hots are they are sometimes called. Ketchup is prohibited, but really would be taste overkill with the tomatoes. It is fairly common to leave the peppers off if you are not a fan of spicy foods. This place was top notch. I'd recommend it to people that live on the north side or are in the area. The ingredients were fresh and the venue was very cute. It was the bottom floor of a fairly standard looking Chicago three flat building. It definitely has the neighborhood hot dog joint ambiance down. I also got some of their chili cheese fries. It was fine. I'd go back again if I was in the area. Probably would not venture out for this place if I wasn't. I have a very soft place in my heart for Huey's, primarily because it is up in my neighborhood, Andersonville. Their fries are thicker than most and I always have to eat the chili cheese fries with a fork because of the copious amounts of chili and cheese they put on it. Their dogs are cooked just right, and, if you want to try to go a bit healthier, you can subsitute a turkey dog, which I think is just as good. I've gotten many a late-night hot dog from this joint. If you are going to a cubs game and want to grab a good dog before the game, I'd recomend this place. If you want one after, be prepared to wait. Instead of a tomato slice cut in half and placed atop the dog, at the Wierners Circle they put three roma tomato slices on it, which is fine, but my mouth couldn't fit around it so I had to take them off, which was unfortunate. Their chili cheese fries were good. They had alot of cheese, but enough chili with it to carry it off. Out of all the hot dog places sampled for this post, Gold Coast would be the only one that I would not reccomend. I did go to their Midway airport location and perhapse it is just not done to the same level as their other venues, but I was very not impressed. Something about the flavors was not there. If you are at the airport, go with Pegasus's gyro over the Gold Coast Dog. Portillo's does not have the atmosphere that I associate with most Chicago hot dog joints. It is a bit more corporate and muted. However, the hot dog, while it did not stand out from the pack was well executed. If you are a tourist and want to grab a Chicago-style hot dog, but are unsure if everyone in your group is up for the experience, this is a good option becuase they have a very extensive fast food menu. Their chili cheese fries are only okay, but their onion rings are some of the best that I have ever had. Al's Italian Beef I was highly disappointed with Al's hot dog because I absolutely love their chili cheese fries and their Italian beef. Their hot dog was under flavored. I would not recomend it. This place is just plain fun. In 1993, two brothers took a cross-country road trip and sampled hot dogs along the way. This gave birth to the idea of a hot dog shop that severed up all the different styples they ran across. The Chicago style dog was spot on and flavored great. As an added bonus, these had the best chili cheese fries that I have had in the whole city. They use curly fries as their base. If you are a tourist I'd recommend this place above all others. Hot Dougs calls itself the sausage superstore and encased meat emporium and for good reason. They have a wide variety of different types of hot dogs and saugages. I really cannot explain it as well as just going to their site and seeing for yourself. This is a bit out of the way for a tourist, but if you are in Chicago and haven't been, you need to make the time to get out to Hot Doug's. But be warned, get early and be prepared to wait. They are only open 10-4:30 and the line often takes an hour or longer. Totally worth the wait, trust me. If you are a tourist and with people who like hot dogs, check out America's Dog. If you are a tourist and with people who might not all like hot dogs, check out Portillos. If you are a Chicagoian, check out Hot Dougs or Huey's. For a more extensive list of Chicago style hot dogs go to Hot Dog Chicago Style. I got most of my pictures from that site. I just finished up round two of midterms. For some reason these classes do two midterms plus a final. They went as well as can be expected I suppose. They were both 400-level math classes so you really just hope to do slightly better or as well as everyone else. I have been following your blogs on my Google Reader, but haven't had time to comment! Of course when I start blogging more regularly I will start commenting more regularly again too!